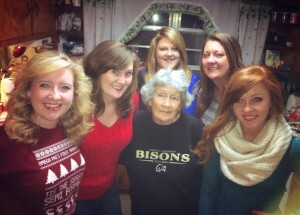 Grandma and her granddaughters…the oldest (me) on one side and the youngest (Kaleigh) on the other. This will be my last post at InspyRomance for a while, and I’m sad to go. I started posting here when the site launched and it’s been a lot of fun. Right now I have too many commitments and need to let a few things go. That being said, I’m hopeful I’ll be back at a later date when life has calmed down some! It’s been a real joy to be a part of such a great group of romance writers. Speaking of romance, I’ve had a few thoughts about marriage lately. The baby of our family is getting married in May and watching her go through the process of falling in love and becoming engaged—and now planning a wedding is a little surreal! I’m the oldest of the granddaughters, and Kaleigh is the youngest—she was born when I was in college. It’s hard to believe she’s all grown up (and hard to accept that I’ve gone and gotten OLD! Ha) but she’s engaged to a great guy and I believe they will have a wonderful life together. Kaleigh is an amazing hair and makeup artist! So glad she was part of my wedding day. 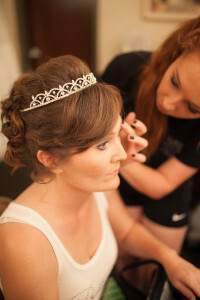 One of my favorite of my “getting ready” wedding photos. Here’s my best relationship advice—that I think can apply to anyone, not just those about to be married! Be appreciative. Saying thank you—even for the small things—is important! 2. You are a team. Act like it. Never, ever talk badly about your spouse or belittle them in public. 3. Choose your battles. This has been a big lesson that I’ve had to learn. In the great scheme of things, a toilet seat that gets left up or dirty clothes that don’t make it to the hamper are not important things to argue about. My grandmother told me once that she and my grandpa spent a lot of time arguing over taking the trash out. She told me after grandpa had died that she wished she’d just let it go—and she encouraged me to do the same. “Let it go” is something I have found to be very helpful in my life—in pretty much all relationships, not just marriage! You can’t take back words after you say them—you don’t want to get into a heated argument over emptying the dishwasher and say something you can’t take back. 4. When your spouse comes home, greet them. This one seems simple, but there will be times you’re in the middle of something else. Stop what you’re doing and greet your spouse! I’ve found that if I take the time (or if he takes the time, depending on the situation) to greet my husband with a kiss and a hug when he walks through the door, it automatically makes us both happier. For those few seconds all the “background noise” of life can wait. 5. Pray for each other. There will be hard times…it may not seem like it when you’re still in the early stages of your relationship, but in life and in marriage, things happen. It’s much easier to navigate those things when you’re praying daily for each other. What about you? What is the best piece of relationship advice you have to give—or the best advice you’ve been given? For me, being thankful for the little things we do for each other is so important. “Thank you” is heard in our household several times each day. Wishing you the best, Annalisa! We will miss you! I like your advice. My baby girl is graduating college in May and getting married in July! Our other children have been out of the nest for a while. I like to add meditate on first Corinthians 13, the love chapter. I frequently put that on wedding cards. Love is patient and kind, not proud, but gentle and meek…. God bless! All very important things to remember, Annalisa. I especially agree about never belittling a spouse in public and not nagging/picking your battles. Mutual respect and encouragement is so important or those little “digs” can begin to undermine a relationship. One of the things I’ve learned after almost 29 (!) years of marriage is to take the time (even if only a few minutes) to pray not only for the other but together as a team. I hate to see you leave Inspy as one of our few remaining original members, and I hope you can come back and rejoin us in the future. Many blessings to you! Keep your mouth shut during an argument. Angry words will come back to haunt you. Be forgiving and don’t sweat the small stuff. Sorry to see you go! Thank you for your part in Inspy up until now. One of the best things I’ve heard about marriage is, every marriage is cross-cultural. That has helped me to remember that just because my husband or his family do something differently than my family or I would, that it doesn’t make it wrong, or bad, or inferior, just different. If my husband was from a different country I wouldn’t expect his family to be just like mine and have the same traditions and everything, and I can’t expect that now, even though we’re just from different parts of the same state. All the best to you! I enjoyed reading this post. I hope my soul mate is out there somewhere! For me the biggest thing about a good relationship is communication!! Choose to communicate! I know a lot of couples who don’t talk to each other often enough or about the things they really need to talk about. My husband and I have learned to talk to each other about our personal struggles or about “issues” in our relationship. Honest and open communication with no worries of condemnation has been a staple and foundation in making our marriage last. We became one when we married and we need to communicate like we’re one and not two. Sorry to see you leave us, Annalisa, but I understand. You’ve got great advice here for your cousin and all of us. I tell couples that love is a choice, not a feeling. Making the decision to love no matter what is a good part of the battle! I also often give The Five Love Languages as a shower gift. Hmm. I need to order in a copy, as there’s a wedding shower coming up in my church. We will miss you here, Annalisa. I hope you come back. Great advice! Sorry to see you go and hope you’ll be back soon. So sorry to see you go Annalisa!! I certainly can understand about too many commitments. Hope you can join us again in the near future! I’ve also heard too many spouses put the other down in public or talk bad about them, either while they are present, but most often when they aren’t. It really undermines the marriage & puts your spouse in a bad light to other people. I never air my “dirty laundry” in public. I always choose to speak well of my husband & he does the same. Now that’s not saying we’re a perfect couple, because we have our bad moments too, but nobody else needs to know that or what we argued about & etc. Like what my mom taught me, if you don’t have something nice to say, don’t say anything! We should always strive to honor our spouses and marriage with good talk. Great marriage advice. Sorry to see you go, but definitely understand the need to lessen commitments. Best wishes.